Do your part and ditch the plastic straw with these Eco friendly promotional metal straws. Ditch the single use plastic straws for some of these innovative retractable stainless steel reusable straws. They feature a three part retractable straw that will reduce down to fit into the plastic carry tube. 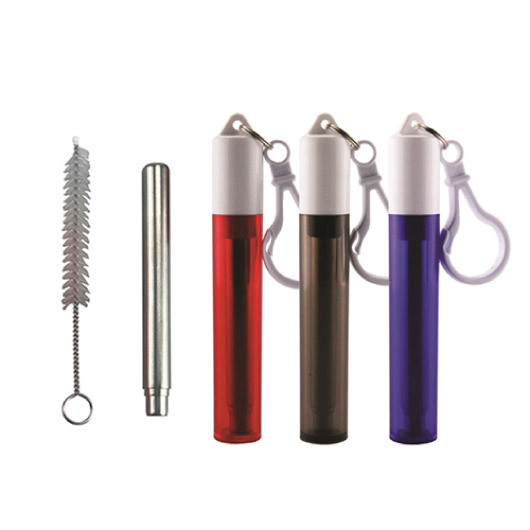 The set comes with a food grade silicone nozzle attached, a screw on lid with keyring and cleaning brush. They're re-usable and easy to carry, simple attach it to a backpack or set of keys and you will always have it handy. These are dishwasher safe but immediate hand washing after use is recommended.